After announcing that he would be retiring at WrestleMania 35 with a final match against Baron Corbin, the Olympic Gold Medalist has been continuing his farewell tour with various matches against other WWE superstars. Last week on Monday Night RAW, Angle continued his tour with a match against Chad Gable, and later took to social media to share a heartfelt message for the younger wrestler. 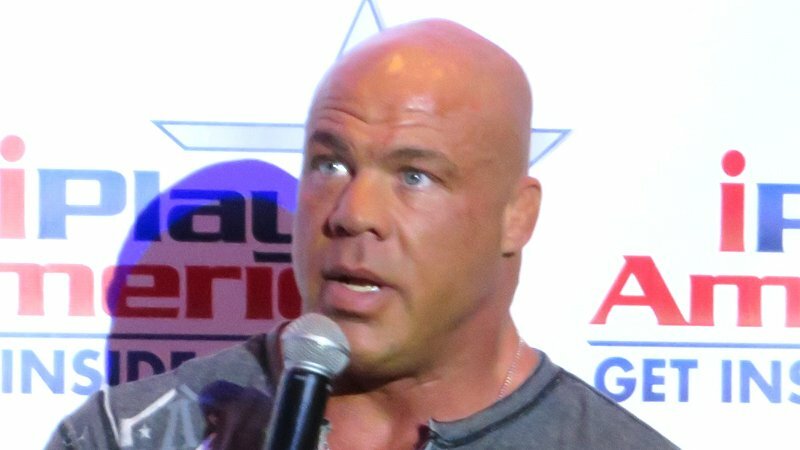 After Gable sent out a tweet yesterday afternoon of a signed Kurt Angle VHS tape that he owned as a child, Angle quoted the tweet and thanked Chad for his support. “You’re an Amazing athlete, and one of the most technical Superstars in the business. It was an honor to be in the ring with you.” said Angle in the tweet. Following that tweet, Angle took to Instagram earlier tonight and shared another message for Gable, this time taking an image of the pair in the ring and likening it to the classic “Spider-Man pointing at himself” meme. As Angle ramps up to facing Corbin in his final match, it seems that he’s taking the time to prop up the future of the WWE along the way.